In October and November last year, five men, in desperation to survive, left Azerbaijan and returned to the village of Goyty in Chechnya. Several days later these young men, none older than 25, were arrested by Russian troops and deported to an unknown place they called ”a result of mop-up operations”. Eventually their relatives discovered their dead bodies----their legs, arms and ribs had been broken, and faces were devoid of noses, ears and eyes. In view of this, one must wonder what prompted these men to return to Chechnya knowing they might face certain death. Are living conditions in Azerbaijan so terrible for Chechen refugees that they had to risk returning to what is obviously a dangerous land. The international community has willingly accepted Russia’s definition that the war in Chechnya is an “internal affair”, thus relinquishing its responsibility. All the platitudes about “establishing constitutional order,” “anti-terrorist operations,” “a Russian internal affair,” etc., has allowed the free world to close its eyes to fundamental violations of human rights. If judged by Russian rhetoric alone, it would seem that there are no human rights abuses perpetrated by Russia and, therefore, no one falls under the provisions of the 1951 Geneva Refugee Convention. But because refugees do exist, they are classified as displaced persons, which is a totally different matter. Once terms like this are settled, the unabashed officials of humanitarian organizations have a free hand in manipulating the status of refugees. The problem is that full refugee status is not only connected to social and humanitarian acts, but financial issues as well. The number of refugees has drastically escalated, and if the United Nations were to intervene, it would incur such horrifically high expenses that they would be plunged into bankruptcy. And that is the major reason why the conflict in Chechnya is accepted as Russia’s internal issue. Sadly enough, the Office of the United Nations High Commissioner for Refugees (UNHCR) acts within this scenario and refuses to acknowledge that the Chechen conflict is a full-scale war. Hence the misery of Chechen refugees continues. In the former USSR, with the exception of the Baltic States and Georgia, most refugees from Chechnya are treated as displaced persons. Formally independent Azerbaijan, however, is a special case. What Do Chechen Refugees Live On? One often wonders what Chechen refugees live on and how do they manage to get by. The answer is, indeed, difficult. Saying that they live from “what God gives them” is probably as close as one can get. And, in a sense, this is true for Chechens can be spotted begging even in front of Catholic churches. What else are they supposed to do? Certainly not rob and kill! The Chechens have chosen another way than that one of crime. They have chosen the tragical way of returning to the war-torn Chechnya at their own risk. The UN refugee agency does not respond to appeals for mutual cooperation from Chechen civil and human rights organizations. As a result, human rights defenders in Chechnya are under the impression that the Agency is a closed organization. Despite UN leadership calling upon the Agency’s local offices to cooperate with NGOs in order to avoid any misleading interpretations and negative reactions to UNHCR missions, they have not been cooperative. This is why none of the Chechen refugees in Azerbaijan know exactly how many people received full refugee status under the 1951 Convention. Figures vary: there may have been 1, 23, or 40 who succeeded and left for another country; this ambiguity is caused by the local UNHCR representatives, who treat these figures as classified information. On what grounds, though, has never been made clear. The situation of Chechen refugees deteriorates almost daily. They used to receive a regular allowance of $100. Now, due to lack of money, the UNHCR office resorted to a rotational plan - out of 5,000 listed refugees, only 400 at a time can receive money; the others are left to their own devices. Relatives, who are in a position to provide help, support some refugees. A few manage to sell household items that were left after federal “mop-up” operations, which gives them a little something to live on for several months. However, living in Baku, the Azerbaijani capital, is quite expensive. An apartment costs about $100, as does food. Unfortunately, there are very few, if any, Chechens who have 200 dollars. In addition, about one million refugees from Karabakh and Armenia are sheltered in Azerbaijan, therefore virtually none of the Chechens find jobs. Before assessing the efforts of the Chechen representation in Baku, one must look at the issue of political recognition of Ichkeria. If this independent Chechen state has not been recognized in the world, will its envoys be officially accepted? Of course not! And in relation to Chechen representations, many countries use their unfortunate position as an excuse for doing nothing. Fortunately, not all governments have turned their backs on the Chechens. The Baltic States, Poland, and the Czech Republic organized high level activities for the Chechen representations; this cannot be said about Azerbaijan though, whose kowtowing often is a mystery to the authorities themselves. Nevertheless, the inclination towards Russia is obvious - and unfortunate for the Chechens. Careful observation of how Russian leadership deals with Georgia and Azerbaijan, provides an easy explanation for this situation. The negative attitude of the Azerbaijani government towards Chechen refugees largely stems from the fear of provoking “big brother” - Russia, which in its heart has remained Soviet. Irresolute actions, vaguely defined status of the Chechen representation, which de facto functioned as the “Cultural Center of the Chechen Republic of Ichkeria,” and interference of Azerbaijani authorities in its activities, creates sharp contrasts between Chechen envoys and refugees. Moreover, the local leader of the Chechen representative office, Ali Asayev, has not obtained the necessary delegation document from Chechen President Maskhadov, and carries out his activities out of pure patriotism, as he has repeatedly stated. At the start of the second Chechen war, when it caught the attention of Muslim countries, Chechen refugees in Azerbaijan were not so downtrodden. Even Chechen representatives, who controlled the allocation of funds and humanitarian aid, felt their position was strong. But Putin’s visit to Baku and the tragic September 11th event in the United States fundamentally worsened the refugees’ position. Numerous relief foundations and organizations closed down and Chechen envoys, once taking pride in being their nation’s true representatives, could no longer do anything about the aggravating situation. It turned out that the envoys’ efforts in Azerbaijan focused mainly on collecting and distributing humanitarian aid. But even this resulted in many complaints from refugees that ultimately led to problems. Thus, the Chechen representative office had no choice but to announce that refugees wishing to return to Chechnya would be provided with a little financial help to cover their travel expenses. We do not know what our “dear” representatives thought when making this stupid announcement, but this assistance was like handing a rope to someone determined to end his life. It is also interesting to note how relations between the Chechen representation and local UNHCR office developed. Actually, they were quite normal, with no conflicts erupting. In order to facilitate better understanding with the UN structures, the Chechen representation delegated one Chechen whose responsibilities included calming the refugees and holding “explanatory” discussions with them about the humane mission of the UN refugee agency office. This leads one to conclude that inter-relationships between the UNHCR and Chechen representative office fits into the mode of it’s “Russia’s internal affair.” In this way, the UN played a key role as negotiator among international community leaders, but there was no recognition of Ichkeria, nor any provision to afford refugee status to the exhausted Chechens. The Chechen issue has recently been consigned to oblivion and refugees have disappeared from Azerbaijani TV screens and newspaper headlines. Therefore, it can be claimed that the issue of Chechen refugees in Azerbaijan ceases to exist, even though more than 5 thousand of them actually live there. We appreciate Mr. Zeynalov’s raising this issue, which he does often, but it must be pointed out that there is one other group whose conditions are even worse - the children of Chechen refugees. We are not certain whether an official decision was actually made by the Azerbaijani Ministry of Education not to accept Chechen children in local schools and universities, but we do know that, for various reasons, some schools refused to take them in. So in accordance with unofficial directives of the Ministry, an expulsion campaign was launched; and as of now, Chechen students in four secondary schools in Baku have been expelled. Local authorities had earlier decided to shut down a school for refugee children that had been opened with UNHCR assistance; it had been open less than a week. But, within that time, the Ministry decided to take measures to prevent "future airplane hijackers" from organizing strikes against the Kremlin and other cities in Russia. That was the reason given for forcing Chechen students to leave the Aviation Academy of Azerbaijan. Chechen refugees state that it is possible to get by without being officially married, but their children need proof of identity when leaving Azerbaijan with their parents. Otherwise, they might be accused of kidnapping children, which would lead to serious trouble. It looks like Azerbaijan’s Ministry of Justice wants to rewrite Article 52 of their Constitution that states, ”A person born on the territory of the Republic becomes its citizen.” Perhaps officials consider that children born here are actually citizens of another country, such as Russia, where they advise Chechen mothers to go. However, Chechen mothers are not interested in obtaining citizenship for their children; all they want is official proof of identity. The fate of Chechen refugees seems to be becoming worse than that of the Jews. Now there is no United States of America ready to offer shelter as they did with Jewish refugees. The tragic events in the Dubrovka theatre in Moscow between October 23 and 26 provoked sharp reactions in Azerbaijan. Following the meeting with Russian Ambassador Nikolay Ryabov, the President of Azerbaijan, Geydar Aliev, announced the closure of the Chechen representative office in Baku. 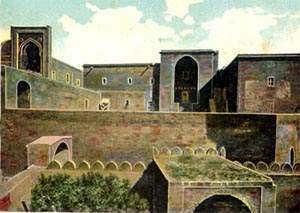 It should be noted that Chechen representation as such never existed in Baku simply because the Chechen Republic of Ichkeria has never been recognized by the international community; this organization was established only as a “cultural center” of ChRI and so functioned as a civil organization. Therefore, apart from its members, no one is entitled to shut it down, nor interfere with its activities, not even the Azerbaijani President, let alone Russian “diplomats”. The tragedy in Moscow was a painful blow to the Chechen refugees dwelling in Azerbaijan since a large number of them were receiving relief aid through the ChRI in Baku. And now even this last source of help has dried up. Azerbaijani authorities started to harass the Chechen refugees: quite often the police stopped them, and local inspectors checked all apartments that were once settled by Chechens. And the Azerbaijani populace, who believed the Kremlin propaganda, began evicting Chechens from their rental homes. Nor are the children of Chechen refugees allowed to go to local schools. For over two months, the head of the Chechen Refugees Educational Center, Ilmadi Shakhizyev, and the Chairman of the Fund for the Protection of Chechen Children, Ruslan Zelimkhanov, fought for permission to educate these children, but to no avail. In fact, the Azerbaijani Ministry of Justice will never grant them the license that is required, simply because Chechen refugees do not have registration permits or Azerbaijani citizenship. After the Moscow debacle, Chechens lost all ray of hope that their requirements would elicit a positive response. The Russian Embassy also put unprecedented pressure on the Azerbaijani media insisting that Chechen “terrorists” not appear in newspapers and on television. It is rather odd how obedient the Azerbaijani authorities can be, and how they acquiesce to all orders given by Russian “diplomats”. One might conclude that Azerbaijan is not a sovereign country at all, but actually the eighth territorial province of Russia. Chechen human rights activists asked many international organizations and foreign embassies to help resolve the issue of Chechen refugees, but their appeals proved fruitless. So the refugees have only one possibility left - to return to Chechnya, at their own risk. Editor´s note: This article was written at the end of 2002 and updated in January 2003.